Another dresser makeover. It’s becoming a regular thing! 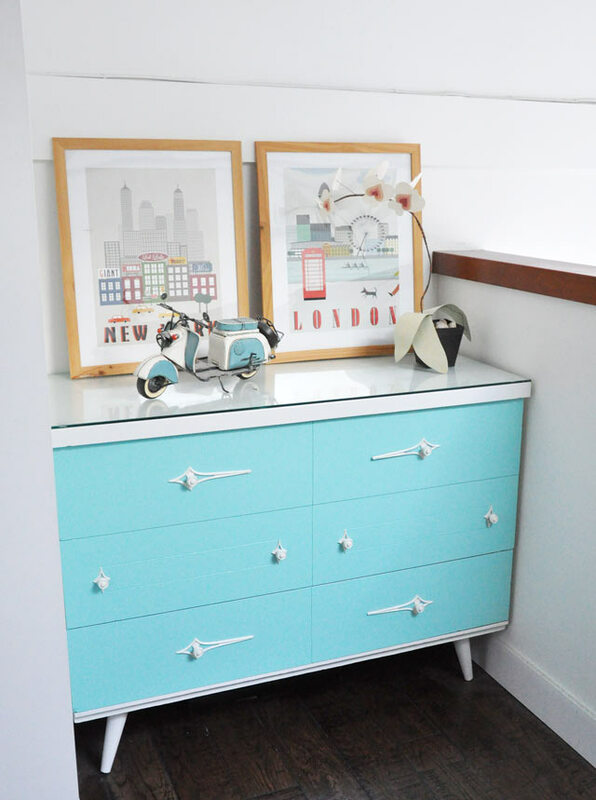 I love giving an old dresser a new life with a bit of paint and new hardware. I’ve been using the same paint colours because I’m on a tight budget and there’s really no point in buying new paint until I’ve used up what I’ve already got. 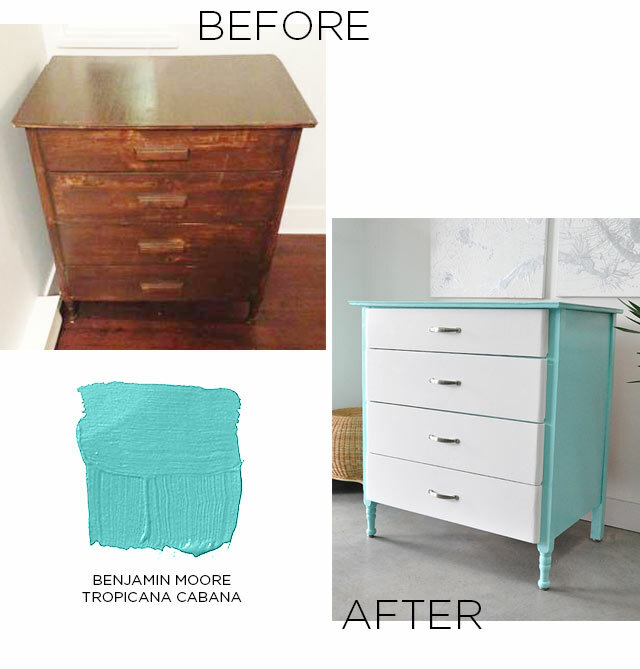 So I did the same colour combination as a recent makeover I did to this dresser. 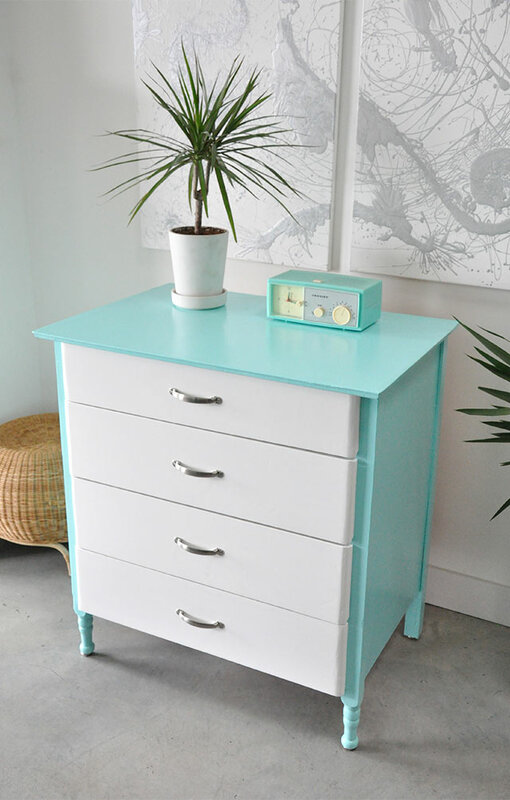 The paint colours are Tropicana Cabana and Snowfall White from Benjamin Moore. Unfortunately I don’t have decent before photos, because I was too excited to start on the project that I didn’t think to snap a few photos. 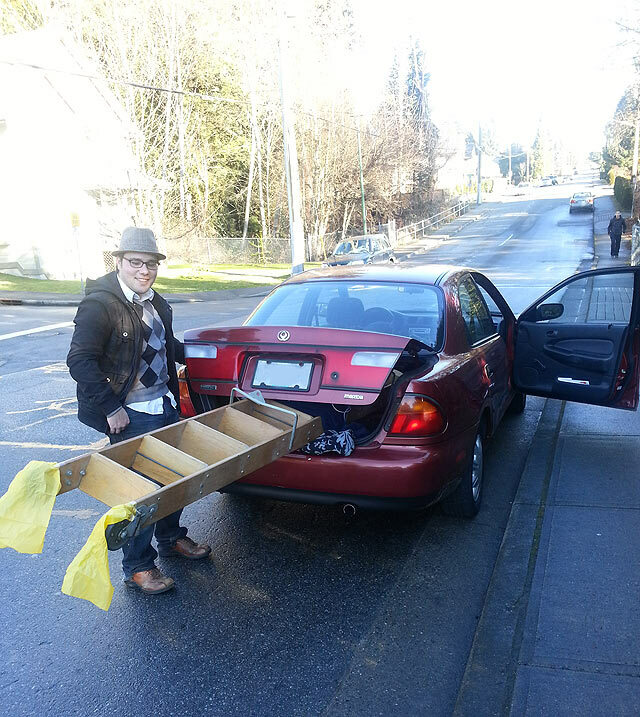 So all I’ve got is the original photo from the craigslist ad and a phone photo of the legs and drawer front. 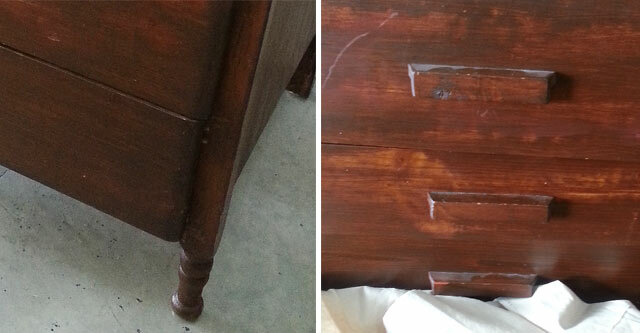 The dresser was badly stained, really uneven with many scratches and chips. The drawer pulls were handmade from wood and in need of replacing. I filled all the chips and holes from the drawer pulls and sanded everything down. 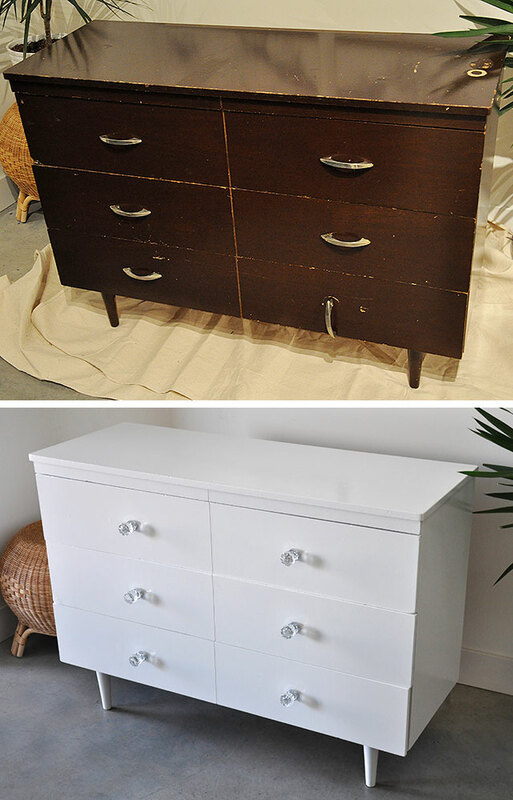 It took 2 coats of primer and 2 coats of paint to cover the dark stain, don’t you think it looks so much happier now? So i’ve started a hobby. It began with a few projects for our apartment, but I’ve now decided to look for furniture that has potential and give it an update, hopefully on a regular basis. This latest find was only $10! Trust me, it was very much so worth $10, it was in horrible shape with a very broken drawer a ton of scratches and chips. I had to seriously sand it, repair the missing corner on one drawer front and follow it up with a primer before the top coat. I had paint I wanted to use up, so I went with an all white enamel for the finish, of course I immediate regretted it because it showed all the imperfections and it took about 6 coats of paint to cover the almost black brown finish. In the end, I decided that it was the nature of the piece since it is probably older than I am. So the imperfections were inevitable since I’m no pro. I quickly got over things and put the focus on the hardware. The existing hardware wasn’t worth saving as it was literally falling apart. I couldn’t do new drawer pulls because the holes didn’t line up with current drawer pull measurements (vintage is different to modern times apparently), so I filled one of the holes and went with knobs instead, since I wasn’t willing to drill knew holes. After filling the holes and sanding and filling them again and sanding again, the stupid holes were still slightly visible once the paint went on. I think it had something to do with the brand of wood filler I was using and the fact that it was kind of dried up. A few coats of paint kind of camouflaged it, but in certain light it was obviously visible. Anyway….I had some crystal knobs in storage for a moment like this. Initially I wanted something understated and modern, because glamour isn’t really my style, but I wanted to be different and had to remember it wasn’t for me, I was going to sell it after. Plus the whole point was to make a profit, so I didn’t want to spend money on knobs. So it was decided, I’d go with something super sparkly to distract from all of the small imperfections I could still see. Check it out below. Our hallway is very broken up with doors, small walls and stairs. There’s a small section of wall that you can see when you walk in the door, and it was asking for some art! My parents gave us these awesome bicycle prints, they have been in our family for years. We had some super old Ikea frames that were actually made of wood, yes, that’s how old they were. So I purchased some mat board from Michaels and cut them to fit into the frames and just like that we added some character to the space. The cabinet below was custom made from scraps of wood and then painted with some extra paint we had from our renovations. I didn’t want to have a cabinet in the hallway, but we had no choice, unfortunately the hallway was the only spot the internet could be installed in our place. So we built this super shallow cabinet to house the wireless router and all the cables, it also gives us a little extra storage. A while ago I posted about a dresser I found that was in need of a lot of love. I realized I forgot to post an update showing how I’ve decorated it. 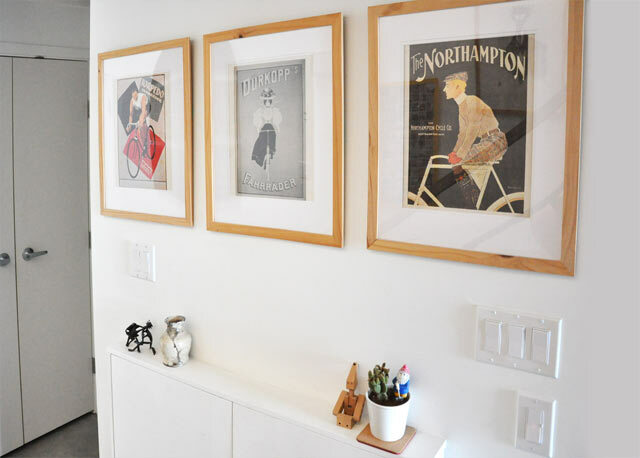 I bought these fun prints at Ikea to fit in some existing frames that were in storage. I can’t let go of this paper orchid Andrew made me when we first started dating, the paper has faded a lot, but our love hasn’t (haha sorry couldn’t resist) so it will stay there until it falls apart. I’ve had the metal scooter for a long while, it just happens to match very nicely. A while back I posted about our library, it’s been over year without a ladder, luckily there’s ladders we can borrow from the building and if we need to reach the very top we use BBQ tongs haha! 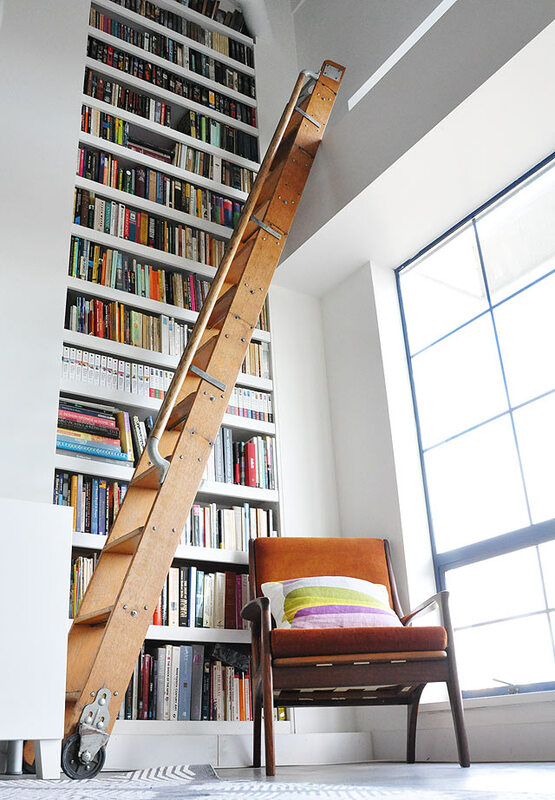 Of course we really want a ladder of our own, but they’re hard to come by and kind of expensive. 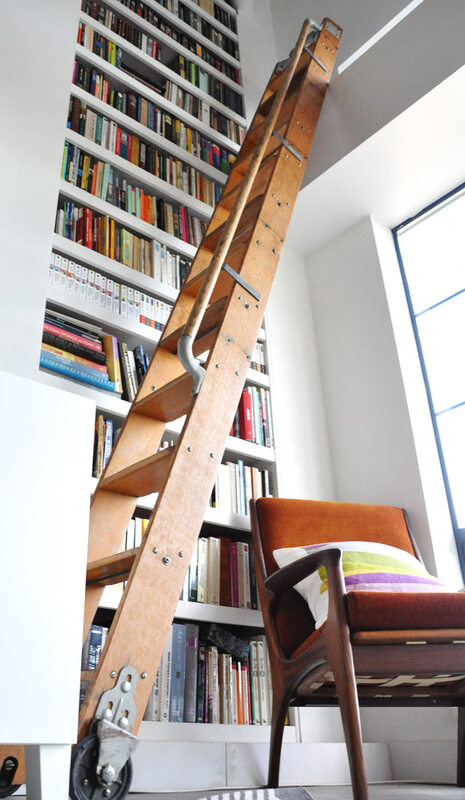 Every week i’d check on craigslist for library ladders, most were over priced, too short, not in good condition. We found one at an auction a few months ago, but it was way too pricey and really short. Above is a photo of Andrew, a smile on his face after a few swear words and frustration and the removal of a few metal bars, we got it in the car! After a somewhat nerve racking drive home, we got to work and by we I mean Andrew. He removed some metal brackets we didn’t want and gave it a wash and then a few coats of oil to bring out it’s colour. This ladder had been sitting in someone’s basement for over a decade, it was really dirty. 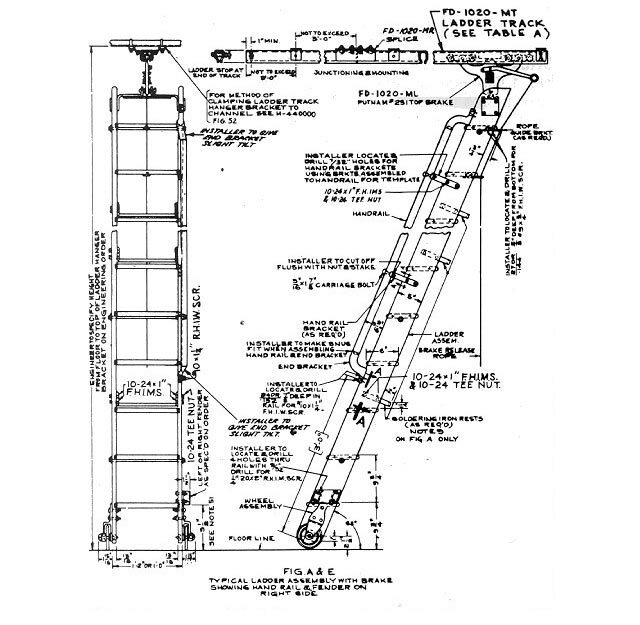 As you may have noticed, the wheels slide vertically, not horizontally, but that’s okay in our situation we don’t even want to have it slide so we’re going to figure out how to lock the wheels in place. 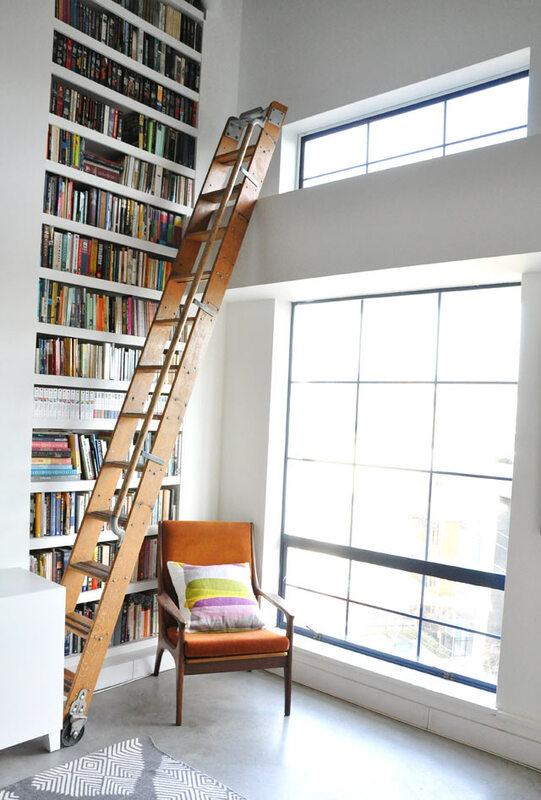 Since our library shelves aren’t stable enough to mount a really heavy oak ladder to, we realized we’d have to figure out a different position for it, plus it would block the window anyway. Check out our temporary set up right now, some minor adjustments will be made, but it’s pretty much where we want it to be and we couldn’t be happier! Finally our hallway feels a bit more complete. 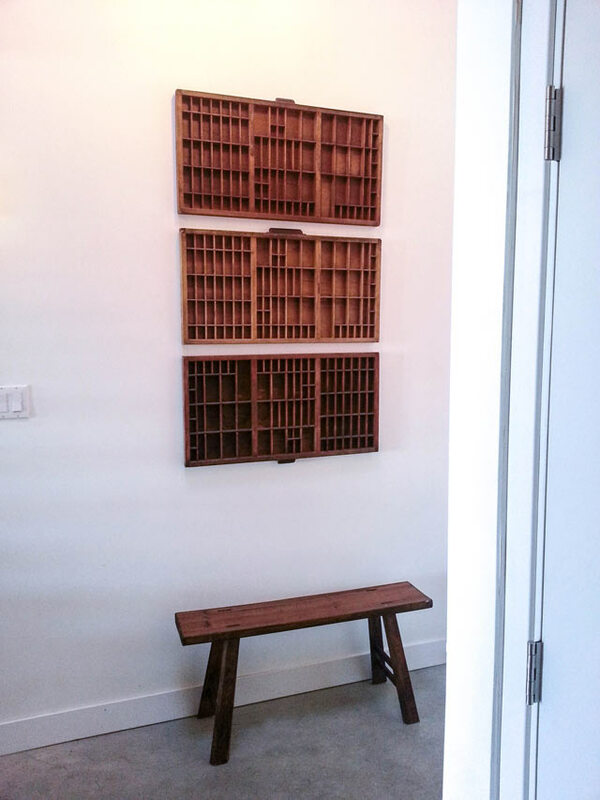 We found a wood bench on craigslist that matches the wood of our type trays, it’s a perfect fit and we’ll be able to tuck our shoes underneath. Lets take a moment to talk about refrigeration. It’s been on my mind a lot lately. 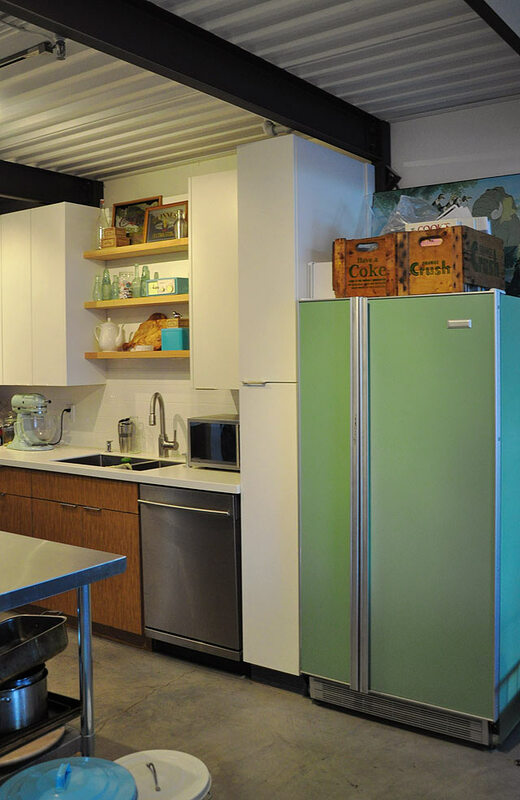 When we bought our place it came with a late 1970’s refrigerator that was in decent enough shape to keep, but we definitely weren’t in love with it, we just didn’t have the budget to buy a new one since we had to get a new stove and dishwasher among other things. So we decided to do a mini makeover on the fridge and paint it a fun colour. You can read more about that process here. About a year later, the paint is still holding up, but the fridge handle is wearing pretty badly. Not only is the paint starting to wear, but the fridge is too. Sometimes in the middle of the night i’ll be jolted awake by the loud motor turning on or off. Or i’ll be watching TV and i’ll have to turn up the volume to drown out the sound of the motor. Other times, we’ll have guests over and the motor will turn on and people will be like “what the heck is that noise?” and that’s when it hit me, I think the fridge is on it’s way out. I’m dreading the day of coming home from work, opening it up and discovering a fridge full of warm rotten food. So, i’ve been loosely fridge shopping online the last few months, trying to find a brand I like, incase the inevitable day arrives where we have to rush out and buy something in a panic. 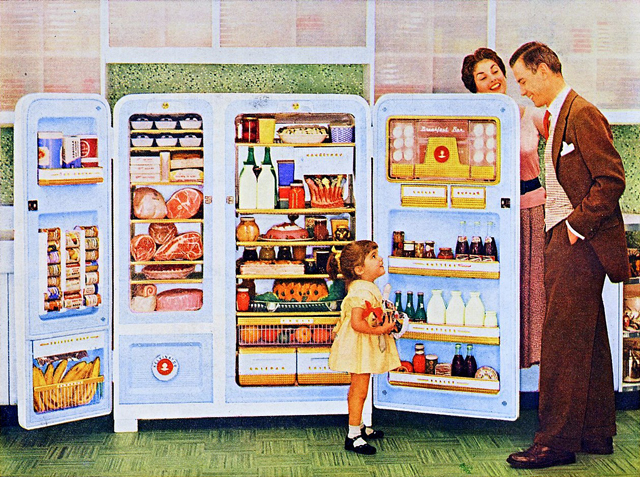 Andrew and I have always been into retro styled fridges, specifically the SMEG (isn’t everyone in love with it?). We lusted over it for years, dreaming of what colour we’d like in our kitchen, but we had never seen or touched one in real life. Then one day it happened, West Elm Market opened up a shop here in Vancouver and we finally got to put our hands on one. From a distance it was beautiful, shiny and fun, but then I reached out and touched it’s smooth shiny surface….. PLASTIC?!! I was so extremely disappointed to discover that the entire thing was made from plastic. It felt so cheap, it felt like a $400 Home Depot fridge in a cool modern/retro disguise. I was sad. I expected a solid fridge with an enamel painted body. I couldn’t believe it. How is it possible for a fridge to cost so much but have so little. We’re still not really sure what brand we’ll be getting, as most are pretty ugly these days. I think my main issue is that it needs to be simple. No ice machines, no water machines, no digital stuff, no crazy compartments with many doors. It should also be energy efficient, but I think most are these days. 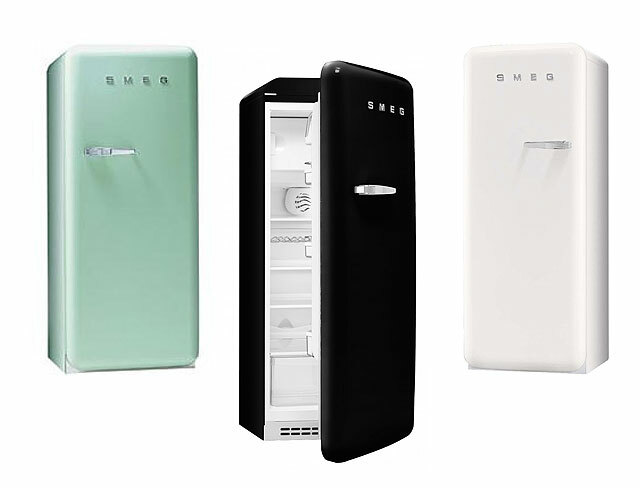 My latest concern is that most new fridges are slick and stainless steel on the front, but the sides are black and ugly. Our fridge is free-standing and exposed in our kitchen, so it’s necessary to have a nice looking side. 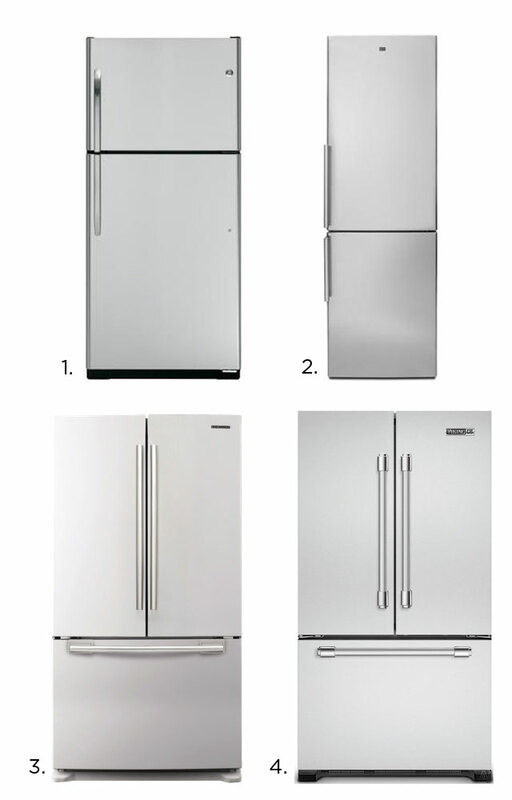 Here’s a few models i’ve looked into, but realized that a quality fridge is pretty dang expensive. 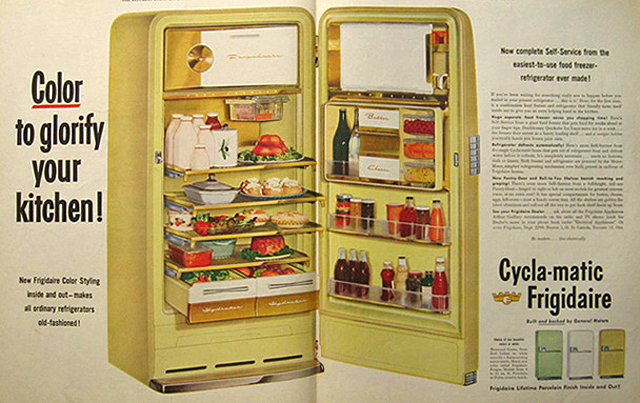 Got any refrigerator you’ve been lusting over lately? Share some links, i’d love to check them out. Hello. My name is Nicole and I’m a graphic designer. I also like interior design and food. I was born in Cape Town, South Africa and raised in Canada. I currently live in beautiful Vancouver, BC. Do you need graphic design services? Click the links below to contact me. Feeling grateful for views like this and relaxing moments at the beach. Also the giant cinnamon bun I had for breakfast was amazing too. Weekends are for relaxing in vintage chairs and making better use of corners in your home. Added this modern white oak shelf from @article to gather some of our small plants and take advantage of the sunlight in this corner. Feels so good to have some vertical storage. 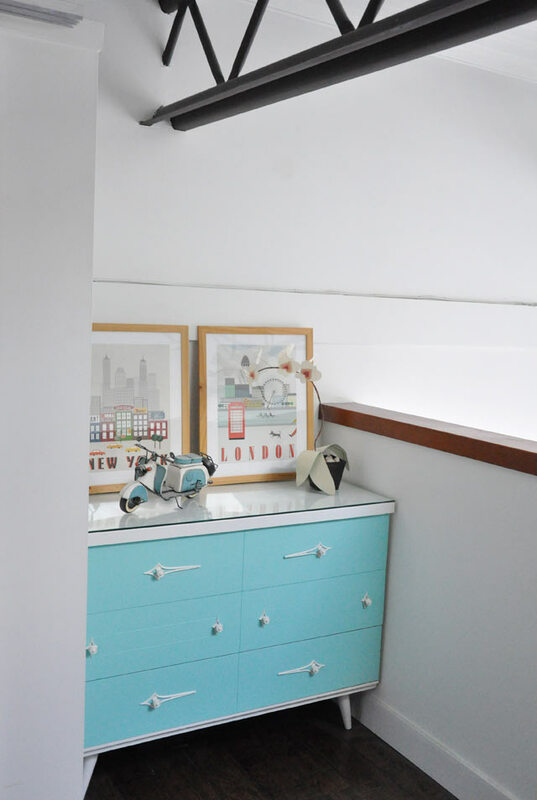 See how to use this shelf 2 more ways + some tips on living with less over on my blog. Link in my profile. The new shelf for all my plants has arrived. 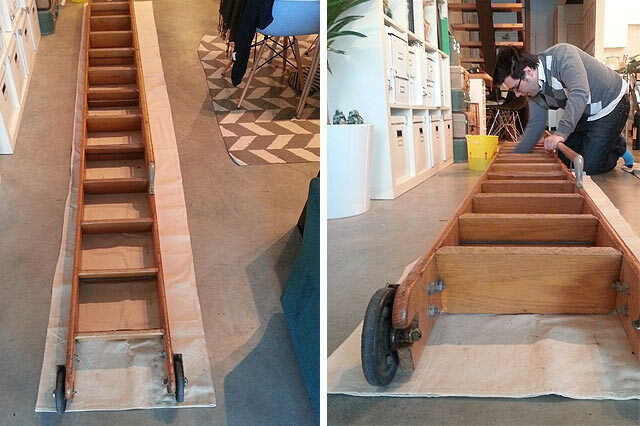 Here's a little sneak peek at how the #shelfie styling is coming along. You know you're becoming a crazy plant lady when you get a shelf specifically for your plants. Gotta take advantage of the light in this corner. Blog post coming soon with lots of shelf photos. The nook is feeling empty. I've got big plans for this corner, involving a shelf and all the plants. I've moved the art and cabinet that used to be here. Hoping the chair will still work with the new shelf, but we'll have to wait and see. I'm excited to take advantage of the window and natural light on this side and grow more plants! Being 30 something means you accumulate many plant friends, sometimes more plant friends than real-life human friends. Am I right? From last year but still a beauty. Looking forward to getting out this weekend to photograph some blossoms before I blink and they're all gone. Totally worth getting allergies.